"He will hold great acumen, a natural prodigy in the Art. He will advance your people far beyond the hopes of even your most innovative thinkers, He will take what I've given you and improve upon it in ways beyond even my understanding. Your people will know wonders, joy, prosperity, and longevity. And He will throw it all away…"
On the eve of Midsummer in -339 DR, the Archmage Karsus, in an act of supreme desperation (some, however, would suggest vanity) cast the spell Karsus' Avatar. His hope was to wrest temporary control of the Weave from the goddess Mystryl (the first Mystra) and destroy the phaerim assaulting his fellow Netherese. His intentions, however noble, were ultimately foolish; he was unprepared to handle the task of maintaining the Weave and all magic on the face of Toril failed for a moment. This was enough to send the floating enclaves of Netheril spiraling toward the earth and cause the deaths of not only many-thousand Netherese, but both Mystryl and Karsus as well. The Weave was irreparably damaged. Mystryl was forced to give up her life by essentially becoming the new Weave, so that Toril was not ripped asunder by its unfettered power. Karsus' body, in its pseudo-god-like state was turned to stone. 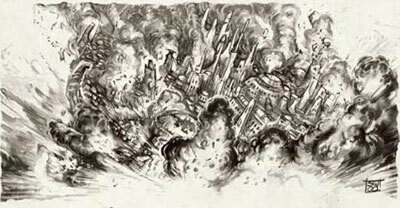 Its massive bulk tumbled with his enclave to land in the eastern reaches of the Far Horns Forest (now the High Forest). His heart, it is said, was warped by the transformation and the momentary contact with the Weave to become the Karse Stone. Karsus' essence was sucked into the astral plane where it drifted, dormant, for many centuries. On the first of Hammer 1372 DR, Galeron Nhimedu (an Evereskan Tomb Guard) finds the Karse Stone and the remnants of Karse Enclave deep in the Dire Wood of the High Forest. After he and his companions temporarily defeat Wulgreth (the lich lord of the Dire Wood) he unwittingly uses it to summon Shade Enclave back from the Plane of Shadow. Thus, beginning the return of the archwizards of Netheril. Additionally, Karsus' essence was stirred and pulled into the Far Realm. It is here that he discovered the method of making Pacts with living beings and experiencing life through them. Karsus became a Vestige. All over Faerun and planescape, his scions heard his voice calling to them. Karsites from far abroad began congregating in the Dire Wood and the remnants of Karse Enclave. They form the cult now known as the Children of Netheril practicing Pact magic to speak with their patron and many other forgotten vestiges. On Eleasias the second, 1372 DR, Shade Enclave looses the Karse Stone in a raid by the Chosen of Mystra. The stone falls into the Lake of Shadow below to be claimed by an unknown divine party (it is speculated to have been Shar, though Mask is another likely suspect). Open hostilities spark between the Heartlands and the Shadovar of Shade Enclave. On the twenty-ninth of Flamerule 1374 DR, adventurers from Thesk find a fragment of the Karse Stone in the ruined temple of a forgotten god of light. How a piece of this powerful artifact traveled halfway across Faerun to end up in a long lost temple is unknown. Even less is known about its true power. On the sixth of Eleint, Nimmik Sarlaeozar, a Red Wizard apprentice, uses the Karse Stone to destroy a malfunctioning gate to the Plane of Shadow. The resulting backlash of magical energy nearly costs him his life. The fragment of the Karse Stone, after being inspected by Maercus Brand and the head clerics of the Tower of Knowledge, remains an enigma. One of its known abilities is the constant "bleeding" of a magic-dispelling liquid. On command it can spray the fluid 10' to cover one person or item. Any magical abilities or functions are suppressed for 1d4 rounds. This includes benefits from spells and the magical properties of magic items (like a targeted dispel magic). Its interaction with relics, shadow magic, and other artifacts is volatile and unpredictable. The Karse Stone is the last remaining piece of the original Weave; the Weave affording mortals the use of High Magic. After surviving the overload of magical energy, Nimmik has discovered a few of the secrets surrounding the stone. Apparently, it can be used to break enchantments on magic items and remove the taint of the Shadow Weave from items created with Shar's magic. By casting a targeted dispel magic into the stone while holding the item you intend to disenchant or cleanse. Additionally, the karse stone provides a significant boost to the spellcaster's dispel check. Nimmik has used this to the groups advantage, already converting some of the Shadow Weave items for their use. Should any check fail, however, the item intended for cleansing is destroyed and the karse stone becomes inert for a period of time. This stipulation is just a theory on the Red Wizard's part, but he is fairly certain of its premise.